This is a no-fluff, straight to the point list of research-based recommendations for your site to meet its objective, including information architecture, usability, user flows, and design guidelines. We’ll also identify a list of quick fixes you can implement on your website right now and start getting some early wins. Quick fixes will include things that can be implemented ASAP, as well as issues that will be covered in the initial redesign. If you feel strongly about some of the things your new site should have, and we know it will hurt your business, we’ll push back and say it bluntly without hesitation. Key findings & high impact - actionable recommendations. First, we’ll do a braindump of observations about your site and what should be done to fix it. This could be the famous elephant in the room, low-hanging fruit, things hiding in plain sight... no fluff, straight to the point observations and recommendations. Focus of the action, which is one of five types: boost conversions, improve user experience, personalize the experience to your different buyer personas, create marketing assets, or Improve SEO. Implication: what kind of activity is it (and which expertise we need on task): testing, analytics, hypothesis, just do it, or further investigate. This is how we prioritize what should be done first. This is typically the point at which your sales team will take over. This becomes your ultimate call to action, your key entry point... the gates of heaven... your website's Arc de Triomphe. We’ll define this goal together for your site. Why can’t we just pick any landing page? Because when a buyer fills this landing page, your sales team needs to be ready to jump in. So it has to work with the way you sell. So, in this process, we will have an in-depth discussion about your sales process too. To be successful, you first need to know what is success. So to be able to distinguish success from failure, we will define a few, but really important indicators, and how they will be measured. Our team will take snapshots and set SMART goals for each. 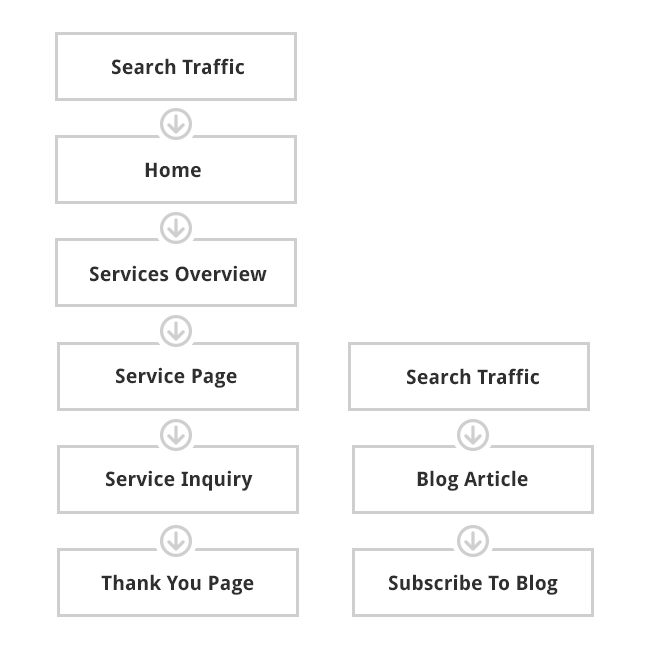 User flows are the steps that we want your buyer to follow through your site to accomplish a goal. For your buyers to engage with your company online, all your information needs to be organized logically. We’ll use deep buyer analysis, analytics and our experience, to define what your sitemap should be. We will define all of the guidelines that should be followed during the design phase. Considering your buyer personas we’ll define everything, from color, look & feel, font types, colors, etc. We’ll evaluate your current site vs. our FOCUSED™ framework. We’ll highlight the good, the bad and the ugly. Feel this is over the top and could be skipped? ...because without a plan, all you'll be doing is decoration at best. The more complex your service, the more questions you need to answer, and the more content you’ll need to answer them. And the more content you have, the more confusing your site will be without the proper structure, architecture and usability features. Basically your website would become an ugly monster.